Thank you. I noticed there’s some text in the video too, seems like a mix of dialogue and prose. Could you translate it? Most of it flashes by pretty fast, so if you’re checking the Youtube version remember you can use . and , to see it frame by frame. I wrote down the timestamps of what looked like the most important parts (there are unsung sentences and words scattered everywhere). The ones marked with an asterisk have pretty short sentences and normally I wouldn’t have added them, but the text is front and center so I think you’re meant to see it the first time you listen to the song. Also, could you comment on the imagery from 2:47? Up until then the animation was… Not straightforward, but it felt like you weren’t really meant to understand it anyways. Then all of a sudden you have the raven thief sitting like a Buddha right next to Buddha statues on lotuses, what I think is a Japanese Ouija board on the background, Hibari and Kudou labeled A and Un (presumably as in 阿吽) and probably more things I’m missing! Especifically, the protagonists’ poses seem a little stilted, so I was wondering if they had religious significance. Thank you for your detailed comment! I’m happy to have a look at the text in the video – it will take me some time, but I would be able to get it finished quicker if someone was able to translate the text in advance. I suspect that I’ll be updating this post some more in the future, so I’ll be sure to add some notes on the imagery when I do 😎 I’ll let you know once I’ve updated the post…! Sorry, did you mean transcribe the text in advance or something like that? I don’t know Japanese so I’m a little wary about writing it down (what if I pick a similar-looking kanji and end up with nonsense? ), but I could take screenshots and link them here. Would that help? That’s the gist of it – having a Word or text document with the translation makes it easier for me to structure my translation and translate. I use Yomichan, which means that I can mouse over words when they’ve been transcribed and I get instant access to my Japanese to Japanese dictionary for tricky words. It’s really handy! A transcription of any sort is helpful, even if it’s just the hiragana and attempts at Kanji. I have a touch screen laptop which allows me to draw kanji on the screen if they’re incorrect, but writing down the rest can be a time-intensive process T_T Checking transcription always takes less time than transcribing from scratch. _ means I couldn’t figure out what character it was supposed to be and omitted it, (¿) means I’m not sure I picked the right one. I always put (¿) to the left of the relevant kanji, while _ substitutes it. There are a few screenshots for stuff that was too hard to see, because of bluriness or the font or anything else. Everything in the pictures is untranscribed (except for the one with the pigtailed Matryoshka doll, just because). While I was doing it I noticed a few things that are sung but don’t appear in your transcription. Two “Maru”s (one after the first “there will be no second time”, another after “This will always be between us”) and one “Hatena?” (After the “irrational academic argument” bit). Both are in katakana. Teniwoha doesn’t seem to be giving us any easy interpretations at all. I’m not really sure how the mentions of food play into the mystery. Somehow I get the feeling that the Professor and the Raven are related- possibly the same person? At 0:48 (where 「ヤツを逃がすな。変装だ！」 is sung), it’s an image of the Professor, followed immediately by a raven in a Matryoshka doll. Does he confirm it in the line 我こそ大鴉ってなもんさ? Also, I picked up on the references to Edgar Allan Poe’s Raven poem. ネヴアモア and 二度とない repeat a lot, so I looked them up. The Japanese Wikipedia page for the Raven (https://ja.wikipedia.org/wiki/%E5%A4%A7%E9%B4%89) seems to have translated Nevermore to 二度とない. Is this consistent with most translations of the poem? I also would be interested in reading an English write up of Japanese mystery tropes if that’s available! Thank you for the translation! Thank you for your comment! I agree that there are no easy interpretations, but I also think that the Professor and the Raven are related. The line 我こそ大鴉ってなもんさ pans to the assistant towards the end, so it’s possible that she’s suggesting it in a joking fashion. Right, one thing that surprised me when I watched the video is that the one who answers every question with 二度とない/nevermore is, if my ear aren’t failing me, Kudou (AKA the professor). * You’d really expect the raven to be the one doing that, uh? And he sounds slighty annoyed at “Will you ever become an honest man?” but only starts getting truly agitated once the questions turn to the Raven Thief. Maybe they’re accomplices. The thing about the real objective of the criminal being training detectives came out of nowhere for me (Like, Kudou, have you exchanged more than ten sentences with him in your whole life? ), but if this theory is true nobody would know better than him. I suppose then the story would end with every case being fake. I can’t really imagine doing actual murders and kidnappings just to teach a young girl some deductive reasoning skills. But aren’t there way too many people involved in the detective murder case? 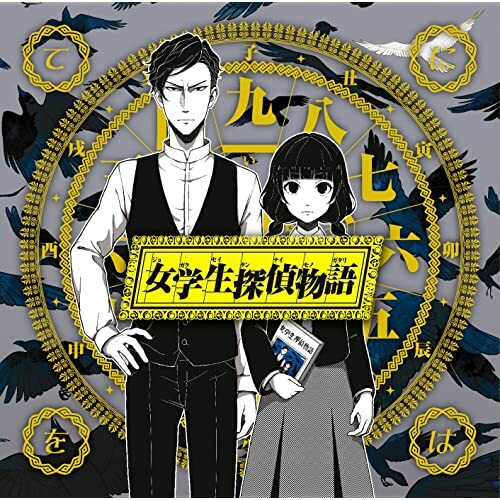 Like, Kudou is a famous author and probably rich, but the detectives would need to lay low for a while after their “murder”, and if they’re such “great detectives” they’d probably prefer not to stop solving cases for months or more just for the sake of a life lesson. I’ll finish this comment there, I have to go to class.